Kriston Capps’s piece for CityLab, “Leave Starchitects Alone,” is filled with so much hooey that I am embarrassed to be inflicting it on my readers. It is part of the continuing effort to tar opposition to modern architecture as partisan and conservative. If the uglification of our built environment is a political issue – and I wish it were – then why do both political parties seem equally reluctant to masticate this big, juicy porterhouse steak? In particular, Capps is miffed at the growing popularity of the word starchitect to denote an all-purpose bogeyman. Capps misconstrues the word and the meaning attached to it. There is (again, unfortunately) almost no political or partisan content in the widespread public distaste for starchitects and starchitecture. Starchitects are disliked not because they are wasteful – though often they are – but because their work is ugly. By ugly, I mean intentionally disruptive to the beauty of cities. Frank Gehy’s unpopular design for a proposed memorial to Dwight Eisenhower has been hooted across the political spectrum because it is ugly. Its few positive reviews embrace its essential purpose as an attack on traditional monument design in Washington. That is a good enough reason for conservatives to dislike it, of course, but liberals dislike it, too. The bottom line is that starchitects are almost all modernists (Robert A.M. Stern, who is known for his classical buildings, is the only American exception), and almost all of their work undermines what most people conceive as the beauty of cities. This, whatever Kriston Capps may think, is the only reason why modern architecture is so widely disliked. By the way, here are my thoughts on the word starchitect in a post, “In defense of ‘starchitect,'” about a year ago. Coincidentally, it criticizes a piece by James Russell, the critic who has just announced his new municipal architecture job in New York City. Good luck to him! Tip of the cap to Justin Shubow, president of the National Civic Art Society in Washington, for sending this CityLab piece to TradArch. 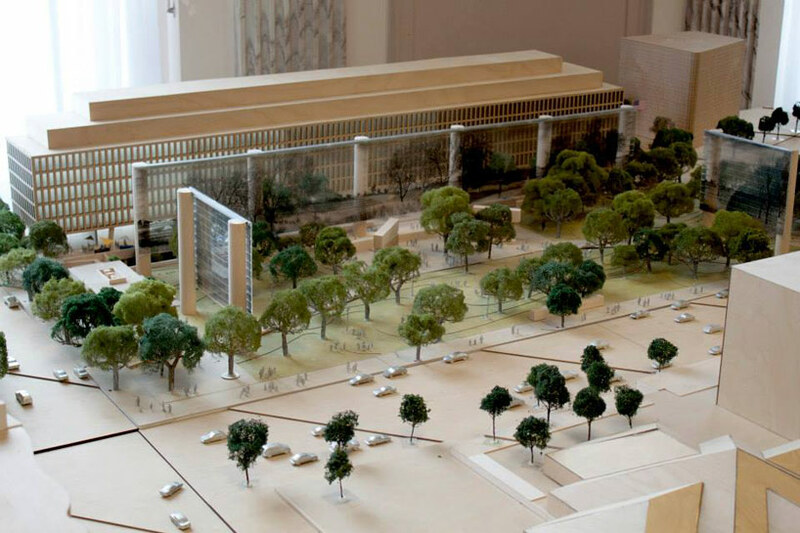 This entry was posted in Architects, Architecture, Architecture History, Art and design, Books and Culture, Development, Urbanism and planning and tagged CityLab, Dwight Eisenhower Memorial, Frank Gehry, Justin Shubow, kriston capps, Leave Starchitects Alone, National Civic Art Society, National Review, Starchitecture. Bookmark the permalink. They were both over the top, Kristen, but Williamson less so because, if you read his article, it really is not an assertion that the trad/anti-starchitect position is “conservative” – though there is a case to be made for that. Capps failed to make the case that starchitect is a code word for anything. Overtly it means celebrity architect and nothing more; if it is a code word for anything, it stands for ugliness, and only among those who oppose modern architecture. While both went over the top in some ways, Williamson had by far the most even-handed presentation of the issues. Capps twisted and exaggerated Williamson’s piece to the point of unrecognizability. He lost his cool. Whether Williamson would treat Capps’s piece likewise, we don’t know. Still, I agree, let the cat fight continue! Capps and Williamson (“The “starchitect” is almost always and everywhere the enemy of the public good”) were both a bit over the top – from opposite sides. Though Williamson lost any credibility with his ludicrous statement “global-warming hysteria has been sustained by celebrity much more than by science” (and just how does Lena Dunham fit into all of this?!!?). but it sure is fun to watch the cat fight both have sparked in the blogo-world! Yeah. I was able only to chip away at the iceberg. Capps was Senior Editor at AIA’s Architect Magazine from 2010 to 2014. Wow, what a surprise! This is modern biased drivel littered with unproved positions stated as fact. Something is indeed leaking, and it not the classically designed roofs… its the weak and transparent agenda. Peace. I’ve just been trying to compose a response to Capps’ essay. It’s such a mess, it’s hard to know where to start.